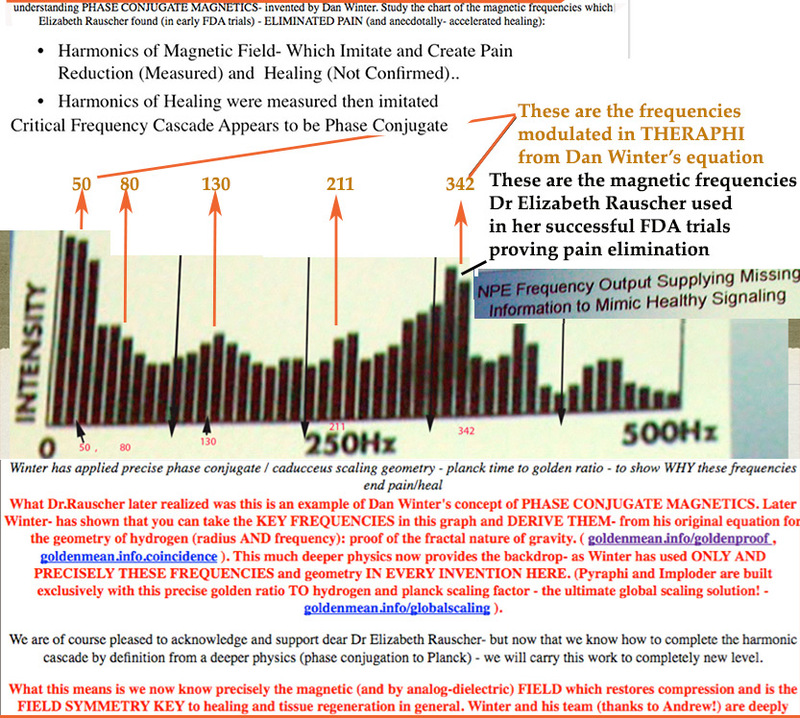 Successful Pain Reduction Study correlates directly to Theraphi PHASE CONJUGATE MAGNETICS- Elizabeth Rauscher’s successful FDA study using magnetic harmonics to reduce or eliminate pain- when analyzed correlates beautifully to THERAPHI frequencies- from- Dan Winter’s discovery of phase conjugate magnetics by equation ( fractalfield.com/physics ) Note not only are these the modulation harmonics in the Theraphi PLASMA- but also exactly these (conjugate/negentropic) low frequency magnetics radiate powerfully from the Theraphi bi-filar Tesla Coil unit. E.A. Rauscher and W. Van Bise, External Magnetic Field Impulse Pacemaker, Non Invasive Method and Apparatus for Modulating Brain Signals through External Magnetic or Electric Field to Pace the Heart and Reduce Pain, U.S. Patent Number 4,723,536, issued February 9, 1988. E.A. Rauscher and W. Van Bise, Non-invasive Method and Apparatus for Modulating Brain Signals through an External Magnetic or Electric Field to Reduce Pain, U.S. Patent number 4,889,526, issued December 26, 1989. E.A. Rauscher and W. Van Bise, Apparatus for Modulating Brain Signals through an External Magnetic Field to Reduce Pain European Patent Number 0223354, granted September 1, 1993.